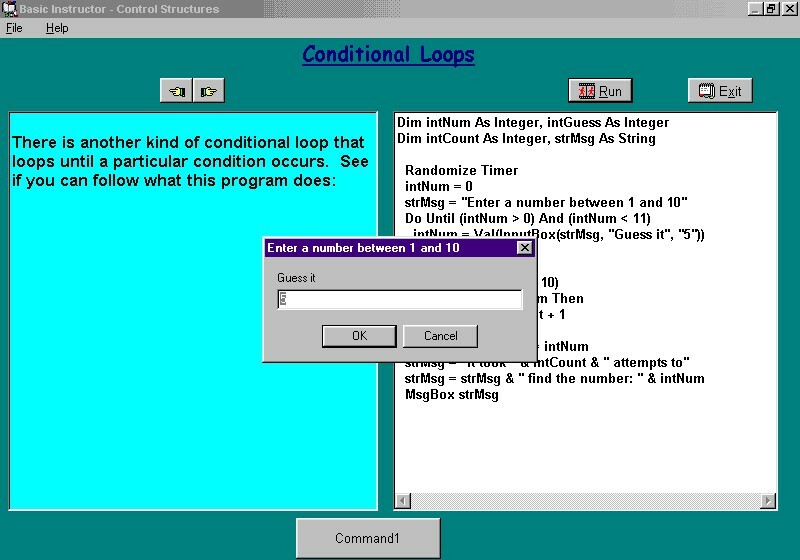 L-Basic 1.23 is computer software developed by CyberMatrix Corporation, Inc..
L-Basic is a Basic language tutorial program. L-Basic emphasizes teaching proper Basic programming concepts rather than how to use visual controls. L-Basic will help you understand how to program in the most popular versions of the Basic language, Visual Basic and Microsoft Access Basic. This is a demo version of the program. In order to use full version features, please go online and order a full version of L-Basic 1.23. The full version is available at regnow and CyberMatrix Corporation, Inc. website for $35.00. L-Basic 1.23 supports English interface languages and works with Windows 98/XP/Vista. We have tested L-Basic 1.23 for spyware and adware modules. The software is absolutely safe to install. Our website has thoroughly tested education product L-Basic 1.23, written the review and uploaded installation file (580K) to our fast server. Downloading L-Basic 1.23 will take several seconds if you use fast ADSL connection.